According to the United Nations, poor sanitation kills 1.5 million children a year. Drinking contaminated water can lead to diarrhoea, the world’s second leading killer of children. 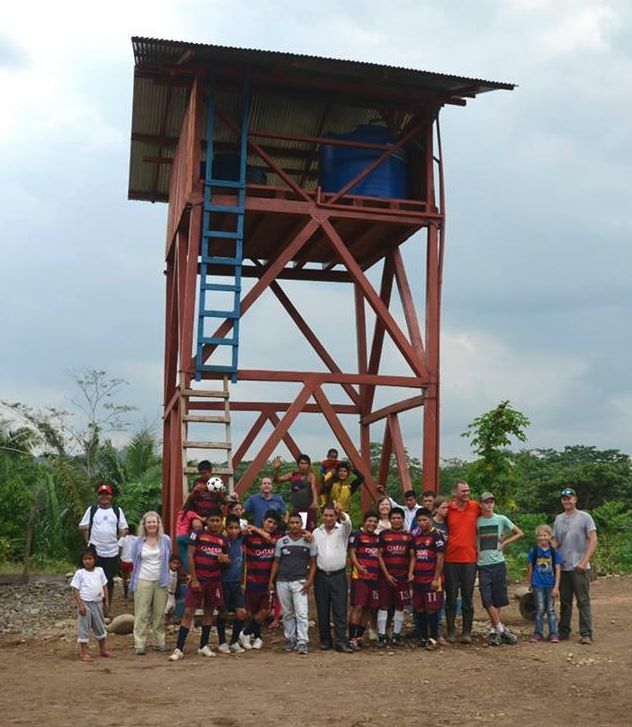 A clean water system installed in the Ecuadorian village of Iwia was inaugurated last year with the involvement of the whole community. This included labour, training and maintenance, as well as education for families on essential health and sanitation practices. Throughout this process the love of God has been shared with the Achuar people of Iwia in many different ways and individuals have been impacted both physically and spiritually. Pray that they will continue to be challenged about their need for the Water of Life. ‘”I heard your voice when I came in. Are you the one who does the programmes in the afternoons?” A woman, about 35, stood in front of radio station HCJB2's manager, Francisco. He had noticed her uneasiness during the tour of the station in Guayaquil. "Yes,” he replied. “That’s me. Can I help you?" She broke down in tears and was sobbing so hard Francisco could only find out her name was Sara. Finally she could explain her tears: "A few months ago I wrote to your station’s WhatsApp during the programme and told you my problem. Without knowing me, you gave me a word from God. That afternoon I was going to commit suicide, and thanks to what you told me on the radio and your messages on the phone, I am now here. And I can only thank you for that." Pray for the impact of HCJB2 as they spread the good news of Jesus throughout the coastal region of Ecuador. A new Kodiak aircraft is flying for fun in Ecuador! Perfectly adapted for jungle flying the aircraft recently transported 200 children supported by Compassion to a camp. ‘It was so much fun to fly the kids in the Kodiak for the first time’ writes Pilot Chad Irwin who made several trips back and forth. ‘In some cases it was the first time, we had even landed in their community!’ Give thanks that our aircraft can bring fun and encouragement as well as hope and healing to remote communities! Pray for the young lives touched by youth camps in Ecuador and other countries. That each and every child would come to know Christ as their Saviour and grow in their faith. In April, a 7.8 magnitude earthquake hit the north coast of Ecuador. Over 600 died, 25,000 were injured, and many thousands were made homeless. The pain and the trauma continues for the people affected. There have been many amazing acts of solidaridad (solidarity) shown by lots of Ecuadorians. They have given huge donations of food, water and other essential supplies, and many have visited the affected zones to help in any way they can. Pray for the Ecuadorian people, for the families affected and for the national church to be able to share the compassion of Christ in this extremely painful situation. Pray also for the government, seeking to rebuild the devastated towns and villages in the midst of an economic downturn. The 7.8 magnitude earthquake which hit the coastal area of Ecuador in April cost many lives and left thousands of people homeless. As the relief and re-construction efforts continue one Christian radio station in Guayaquil has been a lifeline for many. HCJB-2 has been serving the people of western Ecuador for decades and was therefore in a strategic position to send out messages of help and advice throughout the recent crisis. Pray for the rebuilding efforts and for those who have lost loved ones. Also remember HCJB-2 as they try to be the voice of Jesus to people in great need. “I know a little about Jesus but I don’t believe in Him - will you tell me about Him?” This was the question asked by one man in the community of Santa Rosa in Ecuador. The question came about after a new clean water system was installed in the heart of this remote community which had very little spiritual presence when the project began. Many people have now accepted Christ and have become a witness to the other communities around them. Installing water projects in such places has a high cost, both financial and emotional. All materials and supplies must be flown into the community. It normally takes 12 to 15 visits to each project and each visit is 3 to 5 days long. Pray for more remote communities to be impacted for the gospel through water projects. As a medical doctor specialising in international health and tropical medicine, Jaap Bezemer, with his wife, Linda, and their four children, is working with Latin Link for the Ministry of Health and has been placed in Shell, a jungle town in Ecuador only accessible by plane. Jaap’s health clinics provide opportunities to share his faith with oil workers and local tribes people alike. Meanwhile, by being involved in the local school and church, the Bezemers are modelling being family in a local community where many households are broken. Pray for open doors for the Bezemer family, and boldness to take the opportunities placed before them, as they reach out to local people, especially to the Achuar tribe. 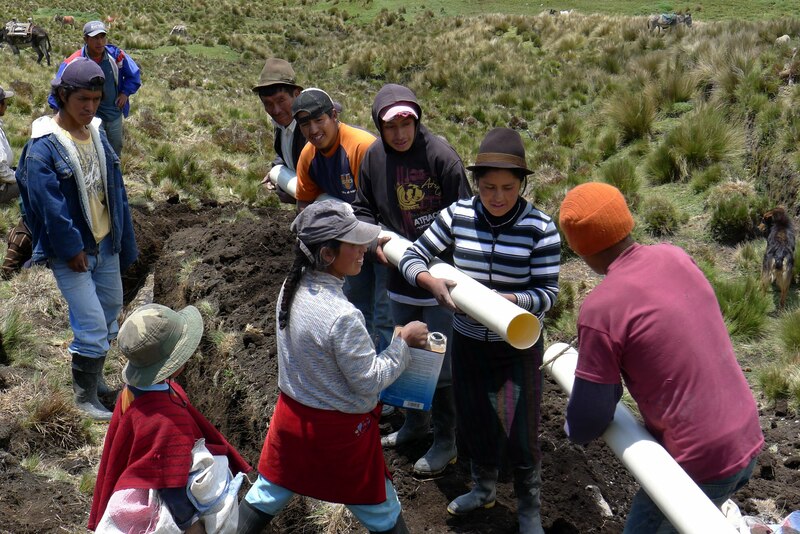 The Andean community of Mariana de Jesús in Ecuador were reaching out for clean water for five years. Identified as the poorest of the poor, they were told that if they bought land they would be given houses and water. So they saved up hard, bought a small plot of land and asked for houses. “To get houses, you must have water” they were told. So they tried to get water. “To get water, you must have houses…” To lift them out of this vicious circle, Reach Beyond engineers helped them build their own water system and experience God’s love in action. A clean water project can be a catalyst for a whole process of long term development within a community. Pray that relationships will be formed, the gospel will be shared, and lives will be transformed both physically and spiritually through clean water projects. Nearly four decades after the discovery of River Blindness (onchocerciasis) in Ecuador, the South American country has now been recognised by the World Health Organization for eliminating this tropical eye and skin disease. First discovered in Ecuador in 1976 by a Reach Beyond missionary doctor, the disease is rated as the second-leading infectious cause of blindness globally. Now the greatest need in the global fight against river blindness is for a new medication that kills not only the larvae but also the adult worms which cause the disease. Pray for those people working to discover this medication. Please pray for those with disabilities in Ecuador. Many suffer discrimination and are ignored, while those who care for them often do not have the knowledge, tools or resources to know how to help. Please pray for projects like Life in Abundance Trust, which works with children with learning difficulties, helping them to become more independent and assisting them in accessing the resources to which they should be entitled through the state. Pray especially for a new initiative for mid-to-late teens in vocational training so that they might even be able to gain some form of employment. There is often a lack of support for women who have experienced domestic violence in South America. Over the past year a new initiative has begun which aims to help some of these women in Santo Domingo, Ecuador. Please pray for God to be at work through this ministry as the workers seek to befriend frightened and confused women and to change attitudes and patterns of behaviour amongst the men in the community. The missionary movement in Latin America is growing significantly, with many of these missionaries serving as bi-vocational workers across the globe. In 2009, it was felt by a number of national and international mission organisations that this new generation of Latino missionaries required an innovative and specialised training programme to equip them for the new challenges and opportunities ahead of them. 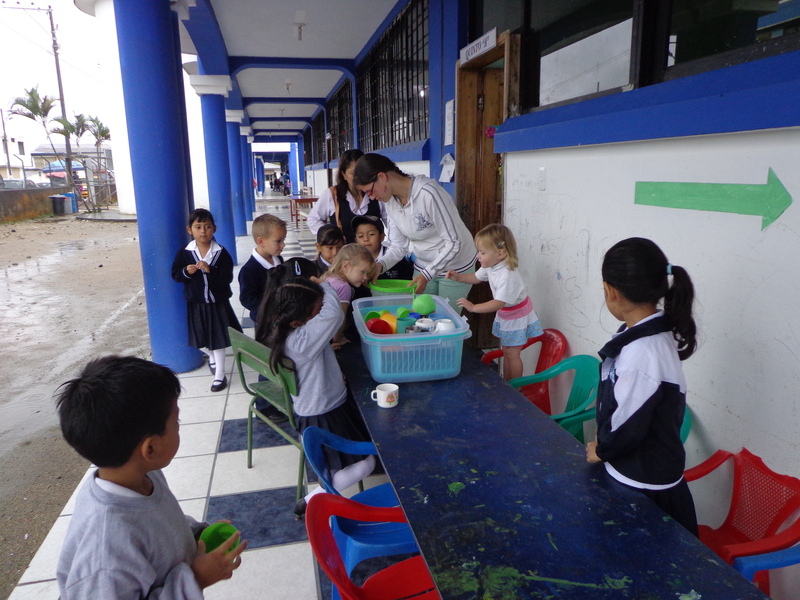 The Corrientes programme was started in Quito, Ecuador with the purpose of creating a new cultural missionary training programme using the tool of individual mentoring. Pray for Corrientes students as they prepare for service overseas, that the Lord will lead them to the place where he can use them most. Ecuadorian society is plagued by high levels of domestic violence and abuse. There are some 83,000 cases each year with eight out of ten women reporting having suffered sexual or physical violence. Pray for organisations and churches working in this context, as they seek to defend the cause of the fatherless, rescue the weak and needy, fight against injustice, and show Christ’s love in action. Research shows that, due to a lack of suitable training, many Latin American missionaries leave their field of service prematurely. To help with this problem a new partnership training programme has been started in Ecuador titled Corrientes ('currents' in English). The programme is designed to prepare Latinos for bi-vocational missionary service around the globe and is staffed by trainers from a number of partner missions. Pray for doctors, nurses, radio producers, engineers and water specialists who are learning how to be both professionals and missionaries at the same time, so that they will have greater longevity and effectiveness in their service for the Lord.